The Bank of China issued Hong Kong Dollar banknotes in 6 different denominations, including this 500 Hong Kong Dollars banknote (Bank of China 1994 issue). They are part of the withdrawn Bank of China Hong Kong Dollar banknotes series. 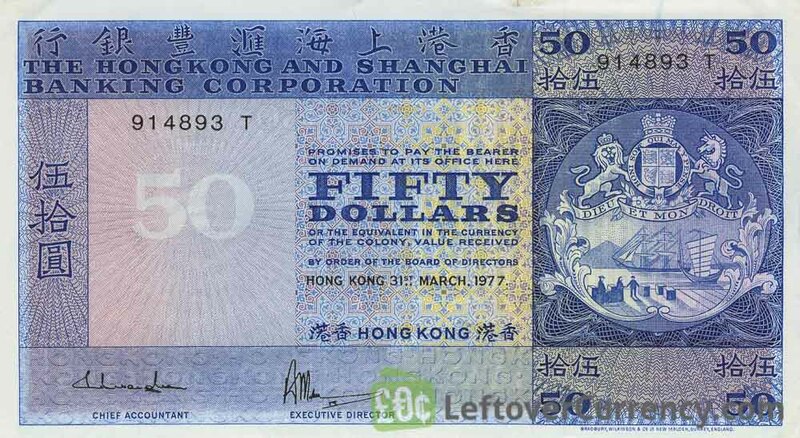 The Bank of China started issuing these 500 Hong Kong Dollar banknotes in 1994. They were withdrawn from circulation in 2012. 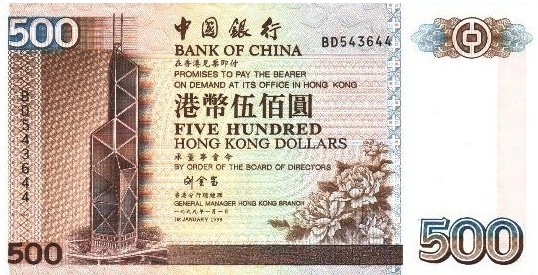 The note of five hundred hong kong dollars measures 158mm by 79mm. Text on the dark brown and blue paper banknote reads ‘Bank of China’. The backside of the $500 HKD banknote features a ship docked at the Hong Kong Container Terminal in Kwai Chung. Repeat these steps for any other notes and coins you want to exchange. Complete checkout and get paid within 5 days of receiving your currencies. To exchange your 500 Hong Kong Dollars banknote (Bank of China 1994 issue) for cash: add it to your wallet now!